One easy phone call to 811 starts the process to get your underground pipelines and utility lines marked for FREE. When you call 811 from anywhere in the country, your call will be routed to your state One-Call Center. Once your underground lines have been marked for your project, you will know the approximate location of your pipelines and utility lines, and can dig safely. More information regarding 811 can be found at www.call811.com. 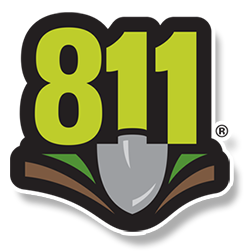 Make a free call to 811 a few days before digging. Each state has different rules and regulations governing digging, some stricter than others.